MLS# 937291 - 16 Link Street Nw, Albuquerque, NM 87120 - The FIRM Real Estate Group Inc. Courtesy of Signature J Homes llc. This beautifully remodeled townhome has all the opportunities that the historic La Luz community offers with a high end modern renovation you’ll love. This home has a beautiful courtyard entry as well as a nice backyard patio space. Hardwood and brick floors bring boldness to this home. The kitchen has new beautiful cabinetry with solid Marble counter tops. The bathrooms have both been remodeled with granite counter tops and and beautiful fixtures. 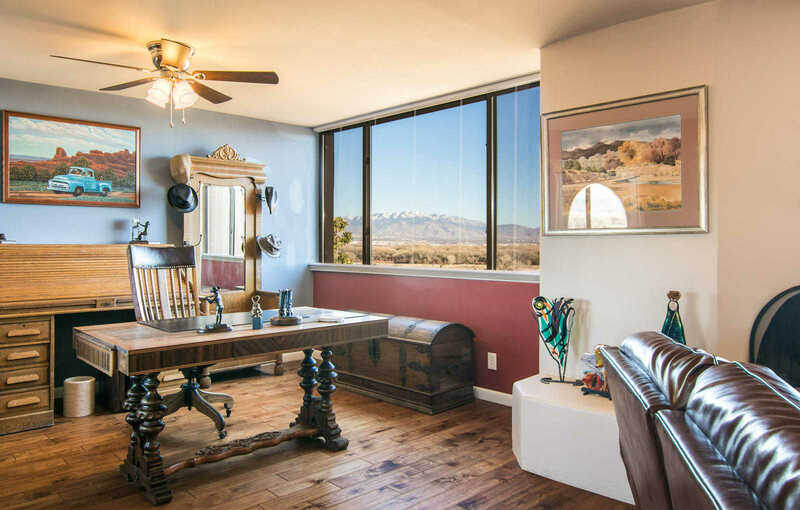 The upstairs Master is currently set up as a den to take advantage of the beautiful east mountain views. The fireplace makes this room extra inviting. The ref air & central heat bring comfort to this home all year round. The garage is fully finished w/ paint, storage and a unique floor finish. You’ll want to make sure you see this home!! !